This La Jolla homeowner was interested in having their pool heater repair and to upgrade pool equipment. The pool upgrades they were in need of included upgrading the pool pump and pool filter. Both of these pieces of pool equipment were older and the pool pump stopped working. 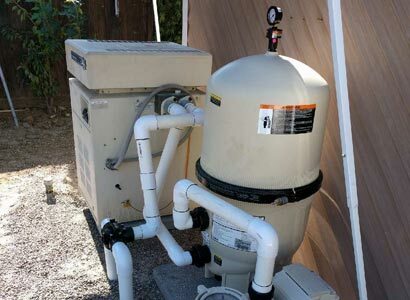 We did not need to replace the pool heater at this moment as it was only needing an inexpensive pool heater repair. There were plumbing repairs needed that included new valves and new pool plumbing from the pump to the heater. Granted this is an older pool heater though when we did a heater diagnostic, it was only needing a simple repair. Even though the other pool equipment upgrades were performed the pool heater was not needed immediately. Because we installed all new pool plumbing, when they do replace the pool heater, it will not include major plumbing work. This is due to the fact that we have plenty of clean plumbing to work with. Replacing this old pool heater will be a normal install as the pool heaters header and gas line are on the correct side. With this pool heater repair in La Jolla, we replaced the gas valve as it was stuck shut and would not open. This is why they opted to go with the pool heater repair for now. This is the best pool pump and it is the pump we install most of the time. 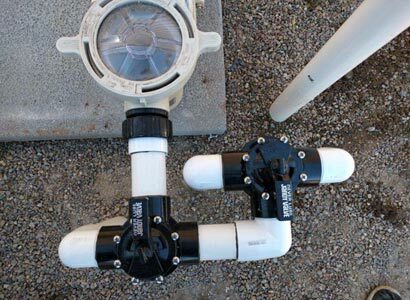 It seems to hold up the best and requires fewer repairs than other variable speed pool pumps we have dealt with. This being manually operated pool equipment, the La Jolla customer will need to turn the pool pump on via the pump’s control panel. 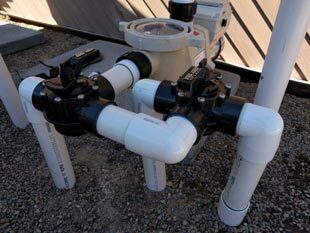 A variable speed pool pump has multiple speeds that operate your pool filtering, the spa jets, and water features, etc. When programming the variable speed pool pump we optimized it to this specific La Jolla swimming pool. This La Jolla pool owner sometimes does his own pool maintenance and a cartridge filter makes it much easier. These Pentair Clean And Clear pool filters are fairly easy to clean for pool service technicians and home-owners alike. A cartridge filter does not require the use of D.E which makes it much less messy when cleaning and you do not need to add D.E to the filter for it to work properly. This cartridge filter requires removing the band clamp rinsing down the internal cartridges and simply reassembling the pool filter. 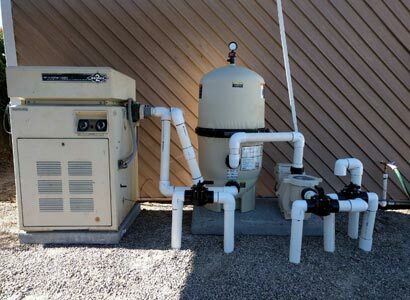 Less mess and easier clean up make this pool filter the best option for this La Jolla pool owner regardless if he is doing the service or if he has a professional pool cleaning service. If you need a pool equipment upgrade or pool repair in La Jolla or any other area of San Diego, we can help. We are a professional, licensed pool contractor that offers complete pool equipment upgrades, pool repairs, and various pool services. If you have any questions or would like to schedule a service or repair, let us know as we are happy to help.